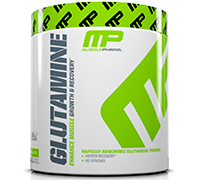 MusclePharm Core Series Glutamine supplement: increases whole body glutamine status by enhancing a person´s uptake, bioavailability and digestion. * Feeding the body a dedicated source of glutamine ultimately provides optimal muscle-tissue saturation. * MP´s Core Series Glutamine is an exclusive array of three pure, yet diverse nutritional glutamine complexes that deliver a substantial range of benefits. * It helps you rehydrate, rebuild and recover from even the toughest of workouts. * Quicker and more efficiently. DEMAND MORE FROM YOUR BODY & YOUR GLUTAMINE. By balancing the acidic and basic levels throughout the body, you can support your gastrointestinal system. * This is all thanks to glutamine enhancing your immune and digestive systems. * Glutamine in the digestive tract can use up to 25% of the glutamine in circulation. Under intense stress, this level increases. Glutamine helps in the repair of the gut lining, immune function, and maintenance of gut bacteria. * As an athlete your body is in constant need of glutamine. The appropriate product is our Core Series Glutamine. Its versatility is impressive, and essential for athletes in training. Get your MusclePharm Core Series Glutamine now!